Barber's talk was titled "Too big to fail: free speech and the future of financial journalism"
The editor of the Financial Times, Lionel Barber, argued the opportunities for financial journalism “have never been greater” when he delivered the James Cameron Memorial Lecture 2018 at City, University of London. Barber said today’s business journalist was more versatile than ever before and able to create content on multiple platforms “in ways unimaginable a decade ago”. The journalist, whose father Frank once worked with the prominent foreign correspondent James Cameron, also claimed that new digital platforms have “led to an explosion of creativity and new forms of rich storytelling”. As reported by Press Gazette, he also said he still believed in the value and future of print in the “age of information overload”, because it could offer a “smart, edited snapshot of the news”. 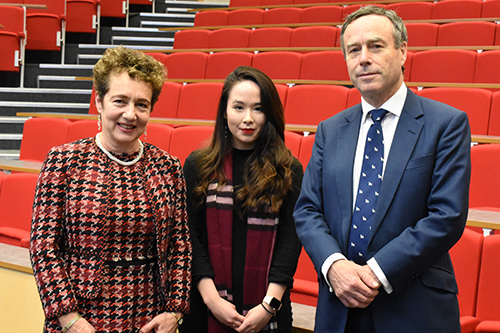 Before he began his lecture, Barber was invited to present the Eric Robbins Prize for Journalism to this year’s winner – recent City graduate Isabel van Brugen. Now a reporter with The Epoch Times, Isabel was recognised for an undercover investigation she carried out for The Times when she was still a student. He then paid tribute to Cameron, acknowledging him as a “master wordsmith” and “one of the finest foreign correspondents of his generation”. During his lecture, Barber laid out the five main threats he said were facing financial journalism. He argued these were: the high number of public relations advisors employed by wealthy companies and individuals; attacks on journalism and reporters’ reputations with “black PR”; the rising power of private markets; gagging injunctions and non-disclosure agreements; state-sponsored press regulation. “The bad news is that the threats to serious financial journalism are hiding in plain sight,” he said. Barber described the large social media and internet companies as “not merely platforms”, calling them publishers which should be held to the same standards as other media. However, he argued that in the internet age, business journalism had turned out to have a more robust business model than general news journalism because its readers were generally wealthier and willing to pay for information. Barber concluded his lecture on a positive note by emphasising the contributions of financial journalism to society. “Let’s celebrate the opportunities as well as the challenges for business and financial journalism which is so much more than a tool for making or losing money,” he said. The James Cameron Memorial Lecture has been held annually since 1987 in memory of the prominent journalist James Cameron. Previous speakers include Robert Peston, Lyse Doucet, Alan Rusbridger and Christine Ockrent.